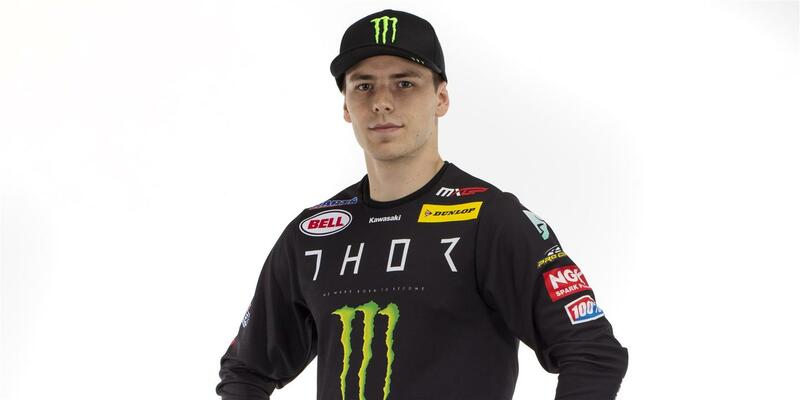 The Monster Energy Kawasaki Racing Team is joined again by the super talented Belgian, Julian Lieber. Julien, from the famous town of Malmedy in the Ardennes, has enjoyed a turbulent career since joining the world series in 2010 as a privateer with the wholehearted support of his family. His evident talent did not go unnoticed and within a couple of years he attracted the support of semi-factory teams in the MX2 category to advance up the rankings to sixth in 2015 before taking a dramatic decision to sit out the following season to undergo a series of operations on both hips to combat a genetic condition which had affected him since birth. The wisdom of this choice was confirmed last year when, re-entering the world stage once more as a privateer in his own family team, the stocky Belgian defied the factory teams to hold the red plate of the series points leader early in the campaign and remain in contention for the medal positions right up until the final muddy GP. Sadly a knee injury unfortunately ended his season and prevented him from representing his country at the Motocross of Nations, the annual world team contest where he had proudly helped his country onto the podium on two occasions. Having learnt from past experience the importance of a complete recovery, Julien has not rushed his return to the saddle to ensure he suffered no unnecessary relapse but he was able to start the acclimatisation process to his new steed at the end of January and, after a week shaking off the cobwebs on a standard KX450-F, he has enjoyed a smooth and successful transfer to the factory KX450F-SR in collaboration with the KRT team staff and partners. He wisely avoided competing in any shakedown events and will make his race debut aboard Kawasaki's off-road competition flagship full of confidence for his rookie season at the opening round of the MXGP world series in Argentina.